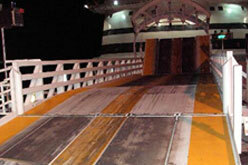 All gangway equipment can be custom designed, manufactured and fabricated at our workshop to suit exact customer application and specification. 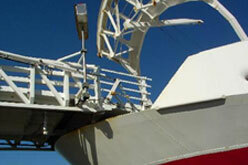 The Sprit of Tasmania Ship loader, This machine uses full closed loop control and smart safety systems to ensure maximum safety is achieved at all times. 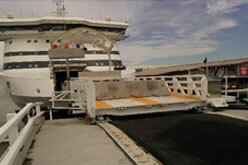 This Access gangway is designed for Cars, Trucks and Busses. It is designed with a maximum load of 24 tonnes across 3 load carrying axels. 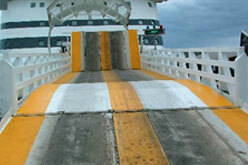 It has the ability to support 24 tonnes without ship contact to ensure safety on the event of a ship to pier break away.